Might as well remake the hugely popular thread from the old forum. I'll start by linking a gif of my Crusader transmog. I'll go hard for a while once season 2 starts but I think I'll be taking a break when GTA comes out. And my battletag is originalpyro#1724 if anyone wants to play. Haven't really played the PC version much since it came out on PS4. Blizzard said they won't be adding seasons to consoles so I might have to come back when season two starts up. Is there PvP on the computer version yet? They have brawling which is just raw, unbalanced fighting but I don't think they'll ever add organized PvP because they claimed it was a, "balancing nightmare." 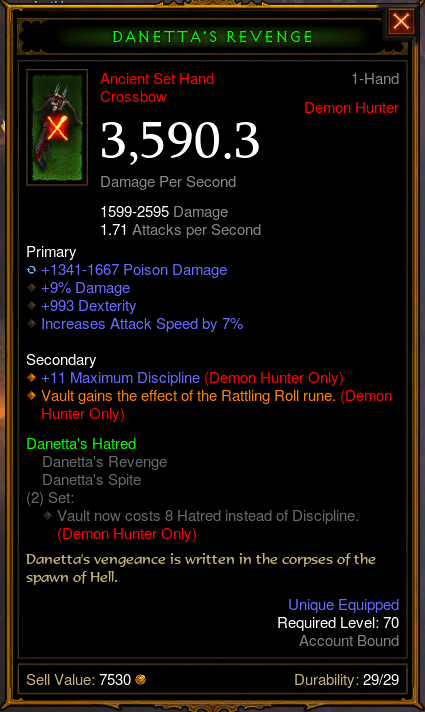 A friend just found this Danetta's but he doesn't have a gift to put a socket on it. 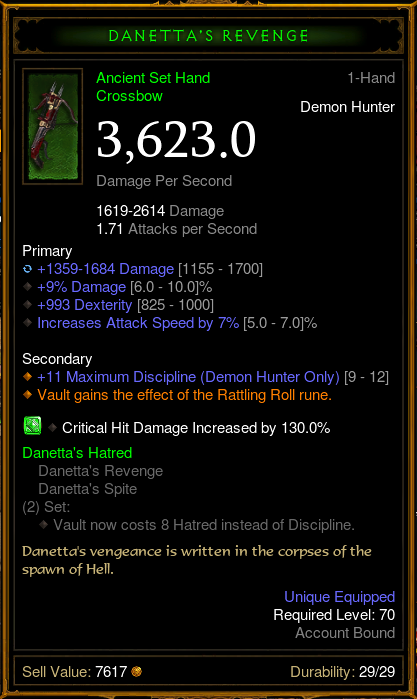 I found a gift while playing with my friend who got that Danetta's Revenge and gave it to him. The thing is now something like 7th in the world in terms of damage. Here's a pretty nice Furnace I found not long after the start of the season. Anyone paragon level 800 with a well-geared Barbarian? Anyone start playing the new season? Kind of want to get this game but I know if I do that I'll skip school for the next 3 weeks. I've played Diablo 2 for the past 10 years of my life. 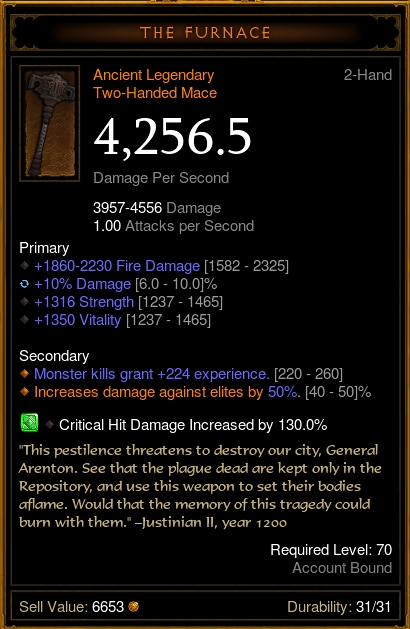 Never played Diablo 3 though. Been playing quite a bit on ps4 the past few weeks. Nearly completed my Might of the Earth set for my barb. Cubed some lut socks for them extra leaps. Plus got a good blade of the tribes. Earthquakes for days. Question, who's playing D3 on a console then? I used to smash D2 on PC back in the day so have been really tempted to pick it up for Xbox. Having read about it online though, a fair few people are saying how it's just full of modders using ridiculous identical gear now and that playing in public servers is a total nightmare/pointless. Can anyone clarify this? Doesn't seem much point if this is the case as to me that takes most of the fun away. It's true yes but you don't have to play public games. I've been having a blast just playing private with a friend or solo. You can also find players on Reddit I'm sure. The game works well with a controller btw. Very well actually. Anyone play anymore? Patch 2.5 just came out but not much has changed.